With Christmas just around the corner, you’ve likely just finished or are scrambling to finish choosing the perfect holiday gifts for your loved ones…but don’t forget to treat yourself, too! We’ve rounded up some of the quirkiest, cleverest, and just-plain-coolest gifts for writers around the Internet. Struggling with writer’s block? The Writer Emergency Pack comes with 26 illustrated cards, designed to help writers get unstuck. The next time you’re trying NaNoWriMo and have no idea what to do with your WIP, whip out your WEP for inspiration! If you love drinking coffee and hate interruptions while writing, this is the perfect mug for you! These socks will be perfect for chilly late-night writing sessions. Purchases from Out of Print also help fund literacy programs and book donations to communities in need. These lovely stickers feature classic illustrations that are perfect for bullet journal aficionados. Choose from Alice’s Adventures in Wonderland, The Wizard of Oz, and The Little Prince designs. Do you get your best writing ideas in the shower…only to struggle to remember them once dry? Then this waterproof notepad is the solution for you! If you won NaNoWriMo this year and want to buy yourself a reward, this adorable scarf is a great way to show off your House pride! If you want to celebrate your love for kidlit, it doesn’t get any more classic than this! As another Out of Print product, proceeds will go toward literacy programs and book donations for communities in need. This T-shirt comes courtesy of the Echo Park Time Travel Mart, a quirky “convenience store for time travelers” that is actually a nonprofit storefront operated by 826LA, with all proceeds going toward creative writing programs for K-12 students. It is very awesome and you should check them out (as well as their equally quirky and noble sister operations nationwide, which include Brooklyn Superhero Supply Co. and the Greater Boston Bigfoot Research Institute). For children’s book writers who also love to party. You know who you are. We don’t judge. How cute is this bookish ceramic vase? You can use it to hold all your fanciest gel pens, or with fresh flowers to enliven your writing space. Of course, we had to plug our very own WriteOnCon swag shop. We’re especially fond of these shirt designs, which have the perfect slogans for writers of romance, action thrillers, or fantasy! Have you ever received the perfect writerly gift that made your day? 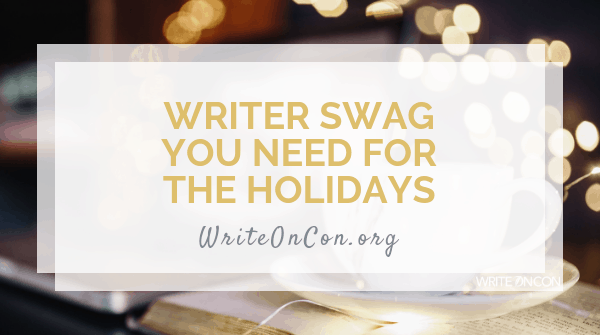 Or have you gotten the perfect writer swag for yourself? Let us know about it in the comments!